Football - Warley Rangers v Hebden Royd Red Star. Anthony Campbell for Rangers and Dan Lumb for Red Star. Hebden Royd Red Star’s long wait for a win over derby foes Calder ‘76 was ended on Saturday. Dan Lumb got the only goal of the game at White Lee Rec, Mytholmroyd, in the only Haslem-Sheppard Halifax AFL Premier Division match to go ahead. Star were making it four wins on the bounce in 15 days, and have climbed to third in the table, while fourth from bottom Calder still have work to do in their fight to stay up. However, Red Star player-manager Chris Garbutt admitted his side had been fortunate to take the spoils against a Calder side who were controversially denied a goal in the first half and hit the woodwork in the second. Garbutt said Calder had forced the ball just over the Star goalline following a free kick to the back post before keeper Brendan Barclay had retrieved it but the referee had not seen it. “That was a massive let-off for us,” said Garbutt, whose side had got the decisive goal five minutes later when Lumb latched on to a loose ball in the box. It was a match of few chances and Garbutt was less than impressed with Star’s performance, particularly in the first half, but he said their good run had given them the confidence to grind out results. It was the first Star win over Calder he could recall in his five years at the club. 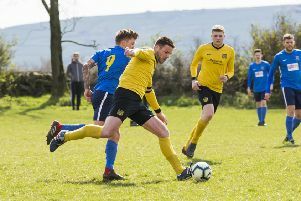 Division One title favourites Denholme United returned to action after almost two months of frustration due to postponements and a couple of walkovers with a 3-0 win away to Illingworth St Mary’s Reserves. Danny Moralee, Michael Midgley and Ross Carnall got the goals as they made it 13 wins out of 14 to go six points clear at the top. There was little to choose between the sides in an even first half with both teams creating good chances. Just before the break an Illingworth corner was cleared and Denholme launched a fast counter attack which was completed when Midgley stabbed the ball home. A stunning Moralee strike made it 2-0 before Carnall made the game safe. Saints produced some good approach play but couldn’t find a way past a strong Denholme defence. Copley United head the chasers after an 8-2 thrashing of Salem. Lee Worrall and Gary Ash grabbed three goals apiece but Copley will be hard pressed to hang on to second spot with only three games left. Fourth-placed Holmfield bounced back from a heavy defeat at the hands of Salem with a 8-1 win away to next-to-bottom neighbours AFC Crossley’s. Nathan Sloane (four) and Craig Gladwell (three) got the bulk of the goals. Mark Kelsey scored twice as Elland Allstars pushed Calder ‘76 Reserves nearer the drop with a 4-1 win at Luddenden Foot. Division Two leaders Plummet Line look likely to be awarded the points after AFC Crossley’s Reserves were unable to raise a team to face them. The second and third-placed teams, St Columba’s and Junction Inn, moved closer to them for the time being with narrow away wins. Saints were made to battle all the way for a 1-0 win against a physical and committed Shelf United Reserves side on the 3G at Lightcliffe Academy. They missed a second half penalty but took the points when skipper Ryan O’Neill arrived late to tap in a Macauley Mountain cross with 20 minutes left. Ryan Barkham and Dan McLeod hit the target for Junction against Sowerby United Reserves at Ryburn Valley High School. There was just one game in Division Three and James Grace. Kyle Peel, Sam Talbot and substitute Will Parkin got the goals in Shelf FC Reserves’ 4-0 win over bottom side Warley Rangers at Savile Park.